Last week, I explained how to integrate SharePoint & Windows Azure with CloudShare (read the full post here). Today, I will show you how to integrate Windows Azure Marketplace data in SharePoint 2010 sites through a Business Connectivity Service (BCS) connector. The BCS connector is created in Visual Studio 2012 RC (VS 2012 RC) and deployed to a SharePoint 2010 farm. 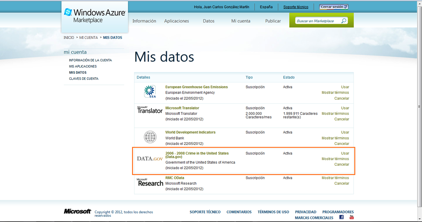 Once we have added the dataset to our Windows Azure Marketplace account, we are ready to create the BCS connector. Open VS 2012 RC and create a SharePoint 2010 Project. 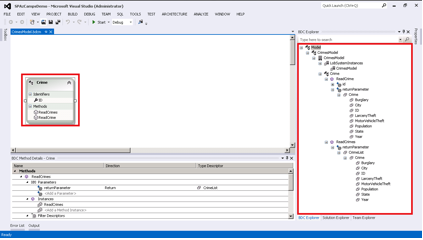 In VS 2012 RC, add a Business Data Connectivity (BDC) model element to your project. This model will contain a single entity – Crime – which will display the dataset. Instead of working with the BDC Model Designer, we’ll write the business logic to access to the data service. 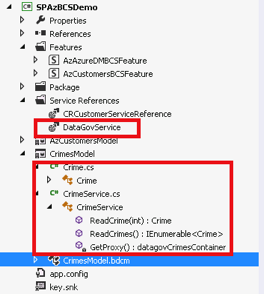 First, add a reference to the service and to the System.Data.Services.Client assembly in the Solution Explorer. All classes needed to work with OData services will be available. The project contains two classes – Entity1 and Entity1Service . We have to modify to add the business logic. Entity1 class defines a base entity with all properties needed to integrate the data. Entity1Service defines members and methods that will allow for the reading of the data. Rename Entity1 to Crime and Entity1Service to CrimeService. 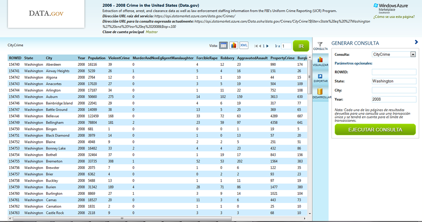 The CrimeService class uses two methods: a “specific finder” method and a “finder” one. 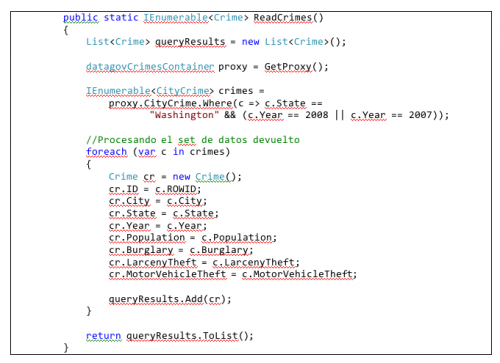 The first method allows us to return a single Crime entity through a unique identifier, run as a query parameter. 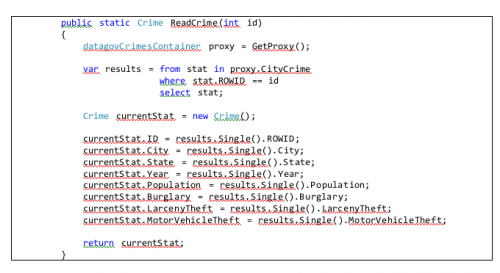 When we finish coding Crime and CrimeService classes, we have to ensure the BDC model includes the same properties and methods implemented in both classes. This work is done through the BDC model designer in VS 2012 RC. We’ve just integrated Azure services and SharePoint with CloudShare. In future articles, I will show you how to integrate other Azure data/services in a CloudShare SharePoint environment. Happy CloudSharing!